Soft and sweet coconut scented cream with protection factor for each phototype. Emulsified oils that moisturize and nourish the skin. 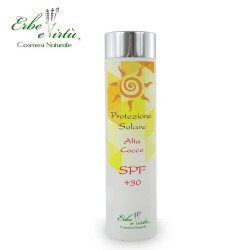 Specific sun protection to shield against the sun's UV rays. Working together with the sun filters, there are active ingredients that make the skin soft to the touch and hydrated. The presence of Panthenol and Sweet Almond Oil nourishes and softens the skin while the Chamomile and Allantoin extracts have anti-reddening effect. Vitamins C and D regenerate the skin that will appear soft and smooth. Easy to apply because of its soft and creamy texture that leaves a scent of summer and coconut. Sun Filters, Titanium Dioxide, Rice Extract, Sweet Almond Oil, Wheat Protein, Panthenol, Lactic Acid, Allantoin, Chamomile Extract, Vitamin E, Vitamin C.
To achieve the level of protection indicated by the sun protection factor, 36 grams must be applied for the body of an average adult. Warning: reducing this quantity reduces the level of protection. For greater effectiveness it is recommended to apply the product 10 minutes before exposure. The filters must be applied evenly and for long exposures to the sun it must be re-applied every two hours. After swimming or sweating the filter must be applied again.